Think Lightweight means light duty? 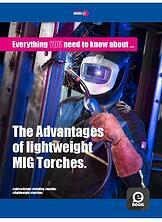 Lightweight MIG torches provide lots of benefits to welders beyond just reduced fatigue. They impact everything from the bottom line to your overall productivity. And we explain how in this free eBook download. You've probably heard about Lightweight MIG Torches, but are they really that much different from a standard MIG torch? Believe it or not, the difference is substantial, and we've done the research so you don't have to. If you've looked at Lightweight welding torch options in the past and didn't think they were built to last, we show you how far the technology has come and how it can perform better than the welding torches you're currently using.